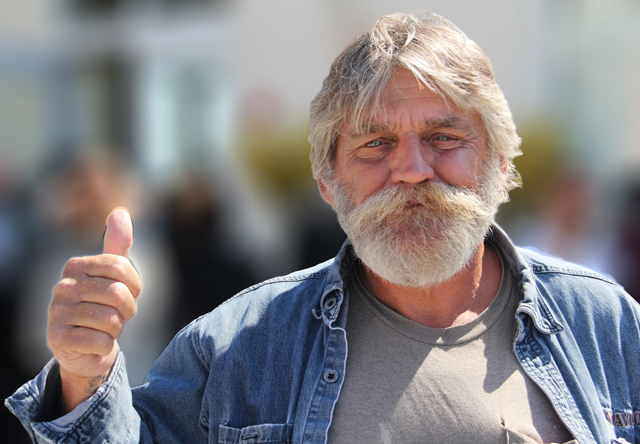 A once chronically homeless Vietnam Veteran gives a thumbs up at Carrfour’s Dr. Barbara Carey-Shuler Manor supportive housing community that is now his home in the Liberty City neighborhood of Miami, Florida. I was eleven in January 1973 when Secretary of Defense Melvin Laird announced the end of the Vietnam draft. Unlike conflicts of recent years, in those days, horrendous images of war weren’t part of what I saw on any of the four television channels we picked up from our home in Lake Barcroft, an idyllic Northern Virginia suburb of Washington, D.C. and a 20-minute drive from the Pentagon. I do remember that was the year the World Trade Center opened as the tallest building in the world. I remember Billie Jean King beating Bobby Riggs in the tennis match heralded as the ultimate battle of the sexes. I remember the excitement about a horse named Secretariat. And I remember some of movies of the year that left lasting impressions, such as Deliverance, Live and Let Die, and American Graffiti. But mostly, I remember the relief I felt knowing that Jonathan Eisenberg, my oldest brother who was then 20 and studying at Cornell, wasn’t going to be drafted. I remember hearing that his birthday, August 13, was picked somewhere near the top for people who were going to be sent to fight in Vietnam that year. The end of the draft meant he wouldn’t have to fight, flee to Canada, or cut off a toe. It meant he would have the chance to pursue the dreams and potential of his life that so many others fought to defend. It’s hard to imagine that just short of three decades later, weeks after his 49th birthday, the same Jonathan Eisenberg would find himself directly across from the World Trade Center at his office within Merrill Lynch’s world headquarters as the Twin Towers were attacked; that he would see people hopelessly leaping to their deaths from the towering inferno, and personally witness the brutal terrorist assault that forever altered the fabric of America and much of the world. Who could have imagined that for Jonathan Eisenberg and others who were saved by the end of the Vietnam draft, the brutality of war would one day come to them? But at 11, long before the horrors of war became a staple of 24/7 news, what I knew then was that my oldest brother was saved from Vietnam and I would grow up in a family without Veterans to give personal meaning to Memorial Day. That changed for me eight years later on my first visit to Israel. As I walked the gravesites at Jerusalem’s Mount Herzl military cemetery, the ages of so many buried there became forever etched in my heart and mind. It was the first time I faced, albeit thousands of miles from America, the stark reality of the price of freedom. Today, Memorial Day includes images of hundreds of Veterans I’ve had the privilege of serving; men and women for whom the horrors, losses and sacrifices of battles fought far from home continue to live as demons not just in the night. Last week, as I held a tearful former Marine in my arms struggling to overcome addictions that long ago robbed him of his family and the potential of his life, he shared words that will live within me forever. “We aren’t made to kill people,” he said. In recent years, I’ve embraced countless others as they’ve given expression to the invisible wounds of war that remain as haunting demons, those who continue to blame themselves for orders passed on that led to the deaths of beloved brothers-in-arms, others who continue to question their own survival in the midst of indescribable chaos in which close friends made the ultimate sacrifice, those whose job was to let families know that loved ones would not be coming home, and many, many more. For me, Memorial Day has become a time of quiet reflection, silent words of gratitude to those who remain only in spirit, the memories of loved ones, and etchings on tombstones and memorials throughout America; a heartfelt prayer for so many servicemen and women whose own hearts, minds and souls remain deeply wounded; and, a renewed commitment to those whose service to and for America made so many dreams possible in my family’s life and the lives of millions more. Not just today, but every day is an opportunity to say “thank you” to those who served and sacrificed for America; for the dreams and potential of each and all of us. Today, especially, is a moment to come together as a nation, families and neighborhoods to bring love, healing, hope and tangible help to so many for whom the battle continues. Seth Eisenberg is President/CEO of the nonprofit PAIRS Foundation in Hollywood, Florida, an industry leader in evidence-based emotional literacy and relationship skills training that provides services to Veterans nationwide.